The significance of the stone cross and the green on which it stands may not be obvious to people visiting Castle Rising today. However, they are both important symbols of the village’s history, when a different way of life existed, especially during the Mediaeval period. This is a Market Cross on a Market, not Village, Green and a reminder of how the villagers and locals used to live, buying and selling their goods at a twice-weekly market and an annual fair. 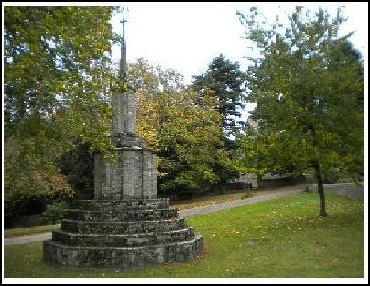 Barnack stone can be seen on the upper part of the Market Cross. This was also used in the building of the castle and church and suggests the Market Cross might well have been erected around the same time. The top third of the Market Cross seems to be ancient and the rest probably the result of Victorian embellishment during Fulke Howard’s tenure as Lord of the Manor. How near to the original it is, is difficult to say. 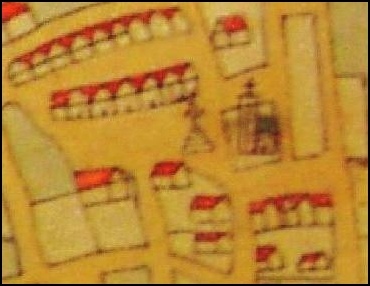 In the 1588 map, the Market Cross is drawn with a more tapered shape than it has today. At one time, it had a fence around the bottom – either to prevent damage or to stop the village children climbing on it! In 1967, the cross on the top of the structure was blown off in a storm and, in 1974, the Market Cross was repaired and renovated with funds provided by the company that had acquired the Old Hall land to construct new houses. The market area can still be seen today in the centre of the village with a church on the east side and boundaries set by the surrounding walls and buildings. The road which goes diagonally across the market area is relatively recent, being constructed in the nineteenth century. In the twelfth century, the houses around the Market area would have been built of wood and cob, the streets mainly rutted and uneven with a central drain to take away any waste, human or otherwise. Markets developed from the exchange of goods in prehistoric times to a barter system as people settled in communities near tracks and green ways that connected settlements. The Market Cross was the focal point beneath which the traders gathered on set days, usually once or sometimes twice a week, to sell their wares. Fairs, from the Latin ‘feria’ meaning feast days, were popular with Romans, combining work with pleasure. It is not clear exactly where the fair was held in Castle Rising. The Gazeteer of Markets and Fairs up to 1516 states it was ‘to be held at the manor’. During the Saxon period, kings tried to control the markets and fairs with standard weights and measures and later by tolls as a further means of revenue. Following the Norman Conquest, the right to establish a market or fair was considered a royal franchise. There is no evidence of a systematic enforcement of this right until the end of the twelfth century when, from 1199, royal grants were recorded on charter rolls, naming the grantee, day of the week for the market and feast day and duration of the fair. However, many royal grants, in the form of charters, certainly existed before this period of recorded grants. Many of the oldest markets and fairs were held by ‘prescriptive’ right - that is, by custom - reflecting the fact that they had been in existence for many years, even centuries. Castle Rising is an example of a village that had a prescriptive right. It was also important for settlements, such as Castle Rising, to acquire market rights in order for them to become proper boroughs. Castle Rising was granted a charter for a market in 1150 by King Stephen, during the time the castle was being built by William D’Albini who had married Adeliza, the widow of Henry I. The 1334 Lay Subsidy Records (tenths and fifteenths tax) recorded that on 24th January, 1297 the Castle Rising grant was held by Roger de Monte Alto (Montalt). Fairs were held once a year and almost always associated with a religious festival, generally a saint’s day. They were usually great gatherings at which people could buy more exotic items, such as spices, figs and rare dyestuffs. The 1334 Lay Subsidy Records show that a charter for a fair at Castle Rising was recorded as being granted to Roger de Monte Alto (Montalt) on 20th August, 1254. This Charter records the fair as beginning on The Ascension of the Lord (Easter). An Elizabethan survey made in 1589, shows that the burgesses had a grant of a fair or free mart at Castle Rising from St. Matthew’s Day (21st September) for fifteen days. Trade was regulated in both the market and fair and with it went a reputation for fairness. The Lord of the Manor would not want to see his reputation damaged and as a consequence his income from the tolls in the markets and fairs reduced. In Castle Rising, a Pie Powder Court (from the French ‘pied poudre’ or dusty feet) operated to try fraudulent traders. At a fair, offenders would usually be fined, and at a market, dragged to the stocks and pilloried. Some markets, such as those in King’s Lynn, Swaffham and Norwich are still in existence but the fair and markets of Castle Rising have long disappeared in the mists of time. However, the Market Cross, on the Market Green, remains as a symbol and a witness of this way of village life which is gone but not forgotten.